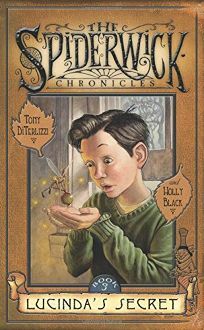 In The Spiderwick Chronicles Book 3: Lucinda's Secret by Tony DiTerlizzi and Holly Black, siblings Jared, Mallory and Simon, having escaped goblins and trolls, are now being harassed by a house boggart. Mallory thinks the only way to stop the madness is to get rid of the Guide. And the only person who can help them is their strange old Aunt Lucinda.